Yes, 141 football fields; each one is 100 yards, and you would have to run every one at an average speed of 5 mph (the average walking pace is approximately 3 mph). Each chip is 13 calories, plus just 1 tablespoon, probably just about a chip’s worth, of dip is 80 calories. That’s a total of about 93 calories each, and there are about 10 chips in a handful, so that’s 930 calories. Believe me, you can eat that much during one play. Diet Pro: You can toast 100 percent whole-wheat pita bread with butter spray and Parmesan cheese. Of course, it won’t be the same, but it’s low in calories and will taste great. Pizza AND a cheeseburger ­ what will they think of next? Each slice is 490 calories, but it is hand tossed. Diet Pro: Try thin-crust pizza, and if you really want to be super healthy, how about getting pizza without the cheese ­ just add your own Parmesan. Diet Pro: How about having just one or two? If that’s not possible, your best bet is NOT to go to White Castle. You could also make your own burgers ­ white meat turkey burgers if you really want to be super healthy, or at the very least very lean ground meat. You ever see those coaches? They’re constantly running around ­ not to mention the stress. There are some high-calorie beers out there, and this is one of the highest. Diet Pro: Unless you love Sierra Nevada and realize the calories, your best bet is a regular beer OR, even better, one of those micro-light beers. The best would be Beck’s Premier Light at only 64 calories per 12-ounce bottle or MGD Light, also 64 calories. Michelob Ultra and Natural Light have 95, or you can go very low with Budweiser Select for 55. Sample a few light beers before the game to see which ones you prefer. Have you ever used a stair climber? It’s not easy climbing stairs. Try doing it for an hour for just one Sloppy Joe. This is a Tex-Mex creation that includes fatty ground beef, sugar, ketchup and even flour. Sloppy Joes have more than 500 calories with the bun (about 150 calories). Diet Pro: Use lean ground beef and try a low-calorie sauce (without sugar). It will still taste great. Also, add veggies (onions, peppers, broccoli ­ all chopped up) to the meat to lower overall calories and increase health benefits. Stand up, wave your hand and be counted ­ 6,480 times. 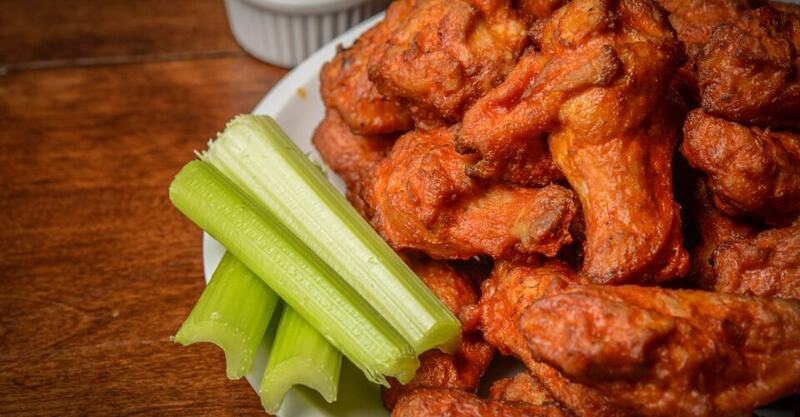 Six wings from Buffalo Wild Wings have 990 calories. Then add about two servings of ranch dressing at 170 calories each for a total of 340 calories. That’s 1,330 calories if you have only a small dip of dressing per wing. The only problem is that, according to The Wall Street Journal, there are only about 11 minutes of actual ball playing in a football game. That means you need to play almost three games of professional football to burn off two handfuls of Cheetos. Keep in mind, that’s 320 calories for about 2 ounces ­ yes, only 2 ounces. Diet Pro: How about making your own popcorn? Sprinkle it with Parmesan cheese and spray it with butter spray. Of course, it’s not the same, but it might satisfy that salty cheese urge. Diet Pro: Try having ONLY nuts. Nuts are healthy, but they’re very high in calories, so don’t keep a huge bowl in front of you. And try to eat them one at a time ­ meaning don’t shove an entire handful into your mouth all at once. That’s more than six hours of cooking, preparing and cleaning. Yes, Bubba Gump is a chain, and the Jambalaya has 1,100 calories. Jambalaya is typically made with chicken, shrimp and andouille sausage sautéed with peppers, onions, rice and spicy sauce. Diet Pro: Make a healthy jambalaya with boneless chicken breast and brown rice. That’s the way to go. Ribs are tasty, but they’re packed with calories ­ as if you didn’t know. They’re fatty, and the sauce is sugary. For the record, Outback Baby Back ribs are 1,156 calories. Little sausages wrapped in bacon ­ popping just four of those in your mouth will cost you 156 minutes of jumping around and acting a bit foolish (the good news is you’ll be wearing a costume). The bacon alone, (without the sausage and brown sugar) is more than 80 calories, for a total of more than 160 calories per appetizer. Four of them go down easy ­ for 640 calories. Diet Pro: If you need to eat some type of bacon-wrapped hors d’oeuvres, go with Applegate Farms Organic Hickory Smoked Uncured Turkey Bacon. It’s only 35 calories per slice. Hebrew National Beef Franks in a Blanket are 60 calories each. Each 12-ounce can is 100 calories. So to burn off just three Pepsis you need to dance for more than an hour to a Beyonce song. Have you heard her music? Have you danced for an hour straight? Diet Pro: Water, flavored seltzer, unsweetened ice tea… there are so many low- or no-calorie drinks. Find one that works for you.